Ralph and Joan Grande of Barnegat, New Jersey, thought they were helping their son Vincent and making a prudent decision when they co-signed on $81,000 in student loans for him so that he could attend Monmouth University. Then last November, Vincent was killed in a car accident at the age of 25. He had been studying to become a stock broker. Every parent's worst nightmare then got even worse: The lender came to them for the payments their deceased son could no longer make, which will amount to $1,100 per month over 15 years -- a hefty sum for the car dealer and social studies teacher to come up with. The story is tragic, but has a clear moral: Don't co-sign on anything for anyone, ever, and especially don't co-sign on something as big as a a five-figure student loan debt where, in the event that the borrower is unable to make payments, there is no collateral that can be sold off to retire the debt. There are an infinite number of reasons your student could find himself unable to pay back his loans, leaving you on the hook: He might be able unable to find a job. He might decide he doesn't want to make the payments. He could become a drug or alcohol abuser, or he could join a cult that requires him to tithe half his income. 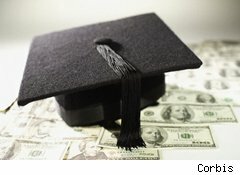 None of these scenarios are pleasant to think about, but all of these things do happen -- and you don't want student loans coming in between your relationship with your child, and you don't want an emotional financial decision you made when your child was 17 to literally ruin your financial life. And remember: if your child is borrowing so much money that he needs a co-signer, that's a sure sign that he's borrowing more than he can pay back. That's why the bank requires a co-signer, hoping that you're naive enough to stick your finger in the dike on a deal that they would never make themselves. Don't believe me on co-signing? Look it up in the Bible. Proverbs 17:18, in the New Living Translation, cautions that "It's poor judgment to guarantee another person's debt or put up security for a friend." Parents: I know you want to help your child. But if you really want to help him, encourage him to pick a college where he won't need expensive loans that require a co-signer.